Key-pa-way is a four-player minigame in Mario Party. It is based on the real life game, Keep Away, off which its name is a pun (a key is used in the minigame, rather than a ball). 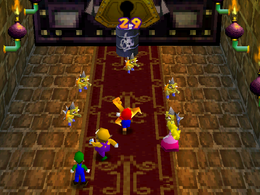 All the players must team up to win this minigame; one player gets a key, and the rest of the players have to intercept the key like a team. If the player with the key makes it to the key lock, all the players win, earning ten coins. If one of the five Spike Koopas gets the key, the game ends and all players lose five coins. Additionally, the game also ends when the timer runs out, thus also making all players lose five coins. Game Rules – "Open the door without letting the Spike Koopas get the key. If they do, the game ends. Press to pass the key." Advice – "It gets easier to pass to your teammates as Spike Koopas approach." This page was last edited on September 1, 2018, at 22:31.